Farro is a whole wheat grain valued for its slightly nutty flavor and chewy texture. Cooking it is fairly simple, but you need to know which type you have before you begin. Once you learn a few basic methods for preparing this healthy grain, you can try a couple of recipes and get a better idea of how versatile it can be. First, check the box to see whether your farro is whole, semi-pearled, or pearled. You have a few options to choose from, and the type you have affects the cooking time. Whole farro still has an outer layer of bran, and it needs to be soaked in water or broth for 24 hours before cooking. It will take longer to cook than semi-pearled or pearled farro, approximately 40 to 50 minutes, but it has the full measure of nutrients and flavor. Semi-pearled farro already has some of the bran layer removed, so you can cook it straight out of the box or soak it first if you prefer. It still contains a good amount of nutrients and flavor, and it cooks in about 20 to 25 minutes. Pearled farro has all of the bran layer removed. It doesn't need to be soaked and cooks in about 15 minutes, but it has fewer nutrients and definitely less flavor than whole or semi-pearled farro. Cooking this grain on the stove top is perhaps the simplest way to cook it, regardless of which type of farro you plan to use. Combine 3 parts water or broth to 1 part farro in a saucepan. Reduce to a simmer, and continue cooking while stirring occasionally until the grain is tender and nearly all of the liquid is absorbed. Pearled farro usually cooks best using the boiling method so you can keep an eye it and make sure it doesn't overcook. The whole and semi-pearled versions can also be cooked using one of the alternative methods. Rice Cooker Method: Using a 3:1 ratio of liquid and grain, put the ingredients in the rice cooker and cook for about 45 minutes. You can even add seasonings to the mix if you like. Pressure Cooker Method: Following the same ratio, cook the farro for about 15 to 20 minutes. This grain is so versatile you can serve it at breakfast or for lunch or dinner. This recipe makes two to three servings. In a saucepan, bring the almond milk just to a boil, and add the farro. Reduce the heat to a simmer, and continue cooking until the farro is tender and the liquid is nearly absorbed. Remove from the heat, stir in the bananas and honey, and serve in individual bowls. 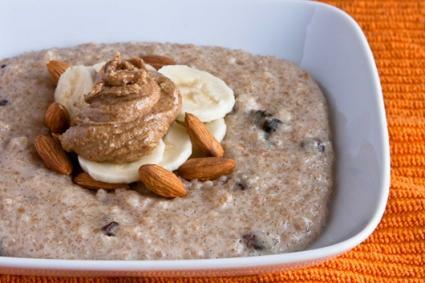 If desired, add whole or sliced almonds and a dollop of almond butter to the dish. Add the farro, reduce the heat, and simmer until the farro is tender and the liquid is nearly absorbed. When the farro is nearly finished cooking, melt the butter in a sauté pan. Add the mushrooms and cook over medium heat until just tender. Add the breadcrumbs to the sauté pan, stirring well, and cook for about two minutes. 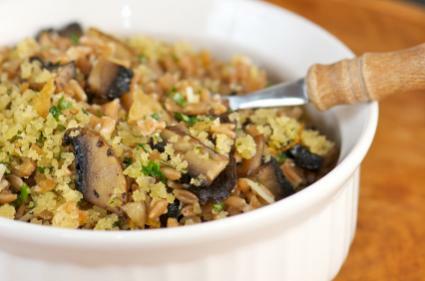 Combine the farro, mushroom mixture, and parsley in a serving bowl and toss. Sprinkle with extra parsley as a garnish, if desired, and serve. Farro is a delicious, healthy grain, but it's important to know that some people have difficulty digesting it. 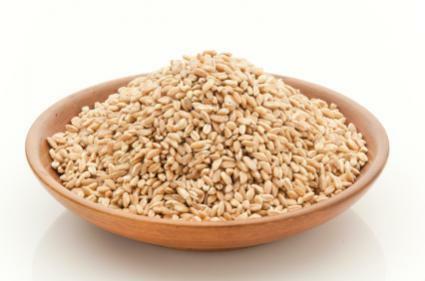 According to Andrew Weil, M.D., you should avoid this grain if you have gluten intolerance, a wheat allergy or celiac disease. If you're not affected by any of these conditions, cooked farro can be a wonderful addition to your menu.